Nowadays there are a number of houses which have been made available for rent. These include a number of big houses and smaller houses too. Most of the people prefer buying bungalows because they are able to afford it. Some people enjoy living in these bigger houses because one can enjoy his own personal space. People prefer these houses because many of them might have dreamt of living in them from a very long period of time and ones they are able to get those houses they enjoy a happy and peaceful life. There are a number of sellers who are renting out a number of houses. They adopt a number of ways by which they are able to rent 1 Kanal houses. What one should do is that before one opts for any of these houses on rent they should read all types of documents very carefully. This is an important thing that needs to be done so a person does not faces any sort of problem in future. Sometimes the wording in which an agreement is written might be difficult for a tenant to understand. So what should do is that the owner of the house should explain each and everything to the person who is taking a specific house on rent. This should be done carefully without miss guiding a particular potential buyer who is willing to take a particular house for rent. What a number of people do when they are looking to rent 1 kanal houses is that they see the pictures of the house which have been made available on the websites. They just contact the seller and without even seeing the house on rent they finalize it. This should not be done. 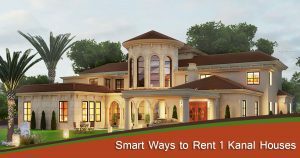 One should go and visit the house before one plans to buy a specific house on rent. If someone sees the pictures of a house which most of the times aren’t updated even then one should not hurry in buying that house by only seeing those pictures. One should first visit the house, he should check it thoroughly whether the house is same as it has been shown in the pictures or not. By visiting the house one may also know that anything of the house needs to be repaired or not. If there are broken handles or cupboards needs to be fixed then one should tell these things to the owner of the house, so he can get the things fixed before one plans to reside in the particular house. These things should be taken under consideration in order to avoid any sort of problems in the future. People should also check where a specific house is located. Whether it is located in the same place as it was told by the owner of the house. One should not hurry in giving the money to the owner of the house before seeing a specific house. It is possible that a particular potential buyer is just being miss guided and there may not be any sort of house available.